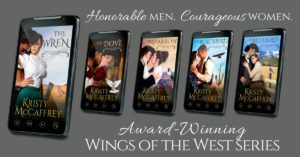 How are the energy vortexes of Sedona related to my cowboy romance story? How did Sedona get so famous? Her reputation as a spiritual center got quite a boost in 1987 when a man named José Arguelles, a New Age artist and author, stated that a great Harmonic Convergence would take place in August, based on dates provided in a 1971 book called Lord of the Dawn by Tony Shearer. During this convergence, the earth would start slipping out of its “time beam” and risk spinning off into space, and there would be a higher incidence of déjà vu and UFO sightings. Only through the focused psychic efforts of the human race would the earth remain in place. If enough people gathered at sacred sites around the world then a New Age would begin, and the earth would remain safe and enter a new era of harmony and love. 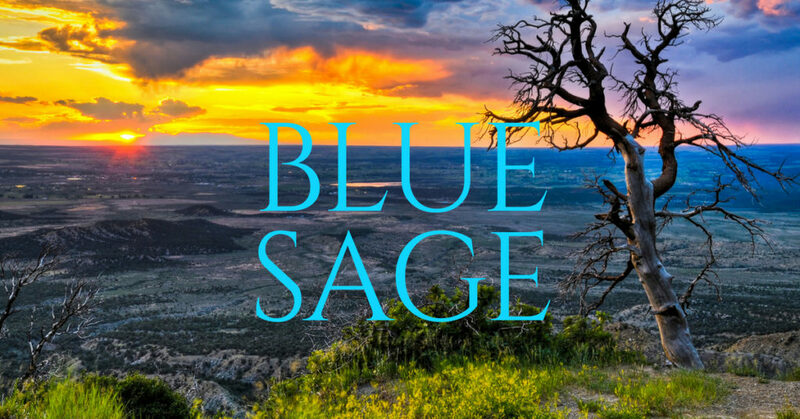 Of course, we know that our home did not spin wildly into space, perhaps because of this widespread moment of meditation of which Sedona was a major player. 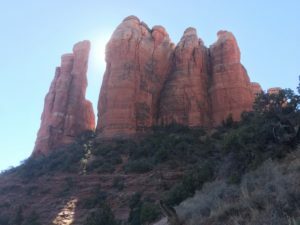 :-)Sedona—located a two-hour drive north of Phoenix, Arizona—is a place where spiritual and psychic energies are enhanced. While the entire town is considered to be an energy vortex, there are specific areas that people visit for maximum meditation enjoyment. The top four Sedona vortexes are located at Airport Mesa, Cathedral Rock, Bell Rock, and Boynton Canyon. Each spot radiates its own particular energy, some producing energy that flows upward while others have energy spiraling downward and entering the earth. My daughter and I at the saddle of Cathedral Rock, Sedona, Arizona. But more importantly, what are these spiritual cracks in the earth? The answer may be tied to ley lines—magnetic pathways that likely hold the secret to bird, mammal, and even bacterial migrations. Confirmation by modern measurements has shown these lines to flow in gentle curves along the lay of the land. Most humans can sense a difference in a local magnetic field of only a few gammas; energetic places like Sedona have anomalies that are far stronger. 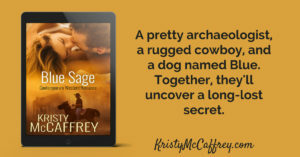 In my recently re-released western romance, BLUE SAGE, Braden and Audrey find a place with magical properties, not far from Sedona. 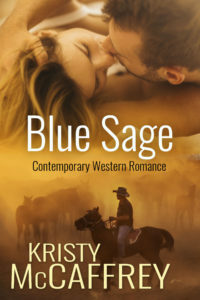 This long novella was previously published in the anthology A COWBOY TO KEEP, and I’ve added minor updates to the text. He’d take care of this problem and then head back to base camp—two airstream trailers and a horse trailer with a built-in bunk for Braden.